Yes, I know Christmas 2018 has come and gone in a whirl, so please indulge me. I want to go back 10 days and share part of our family Christmas Eve tradition of going to The Peabody Hotel in downtown Memphis. The Peabody is bejeweled for the holidays. We snag a table in the lobby bar by the elegant baby grand piano, order specialty drinks and enjoy watching the people. Even though the lobby bar is the center stone for the activity of the hotel, the lobby is comfy cozy and welcoming to guests. Every morning the Duckmaster escorts five North American Mallards from their luxury penthouse accommodations to the lobby fountain, delighting guests. We have seen the duck march a gazillion times, so we prefer to arrive after that event when swarms of people appear to watch the duck march daily. We like to arrive mid day. If you haven’t seen the duck march, it’s worth the time to enjoy and watch. It happens twice a day when the ducks arrive and depart the world-famous Travertine marble sculpted fountain. The fountain was carved from a single piece of Travertine. It’s impressive. 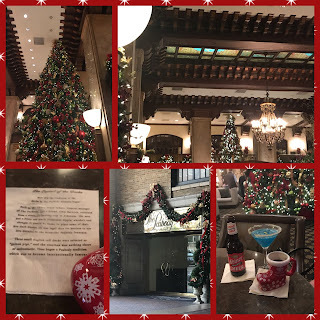 Nothing shows off The Peabody’s marble floors and stately columns like the Christmas decorations and 2 story Christmas tree adorned in lights and ornaments. At Christmas, my eye is drawn upwards to the beautiful stained glass ceiling, and the painted, beamed ceiling that is further highlighted by all the colorful holiday decorations. We like to sit at a corner table by the piano which is always playing holiday music by the Christmas tree. It gives a full view of the Lobby bar and all the activities. It’s a writer’s delight in storing up ideas for new stories. Many authors have stayed and written at the Peabody Hotel, including William Faulkner. The Peabody is a constant in our ever changing city. It’s said the Lobby bar is “the living room of Memphis; the place to see and be seen as well being the beginning of the Mississippi Delta.” If you want to learn more about the history of The Peabody check out this page with pictures of the hotel from 1869 to today. It’s fascinating. 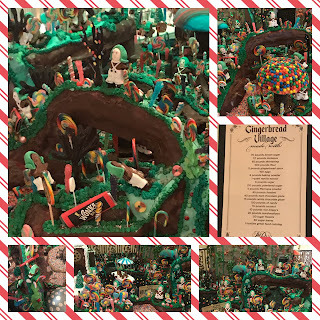 Only at Christmas can you see the gingerbread village, themed differently each year. You can smell the gingerbread from the Lobby bar. It adds to the writer senses, as do the themed drinks, in a layered effect that helps bring life to any writing. This year the gingerbread theme was based from Roald Dahls book, Willie Wonka and The Chocolate Factory. It was a masterpiece. Well done, Peabody chefs. This year I tried a new-to-me adult beverage, a Glogg. It was a chilly Christmas Eve, so the warm beverage was perfect. Glogg is a sweet, warm, spicy, and merry musings of its Old Norse origins, meaning "glowing ember” drink. It’s a drink like Scrooge from Charles Dickens, “The Christmas Carol” enjoyed with the ghost of Christmas present. So Christmas Eve 2018, I enjoyed time with my family while writing this blog and storing up ideas for a future Christmas story.